Thanks for downloading our Guide to Tank Maintenance. 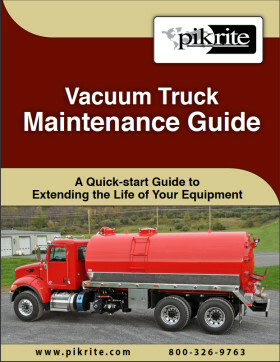 Click here to access your Tank Maintenance Guide. At Pik Rite, we know that when your trucks are in tip-top shape they are producing value for your customers and profits for your bottom line. To serve you better, we’ve recently expanded into a newly built parts warehouse where we stock many of the parts you need to keep your trucks on the road. Our new parts warehouse is home to over 150,000 parts. And, in addition to our off-the-shelf parts, our production staff can manufacture many of the parts you need right here in our shop. We’ve upgraded our parts database and order processing system to provide faster and better service for all your parts needs. We’ve also made it easier for you to pay by cash, check or credit card including Visa, Master Card, Discover or American Express. Please don’t hesitate to contact us for all your parts or service needs. If you want more information on the wide variety of off-the-shelf or custom parts, or to talk to someone from our team of experts contact us at 800-326-9763 or sales@pikrite.com.